“A vineyard of wine, sing of it! 4 “I have no wrath. Then I would step on them, I would burn them completely. And they will fill the whole world with fruit. 7 Like the striking of Him who has struck them, has He struck them? 8 You contended with them by banishing them, by driving them away. With His fierce wind He has expelled them on the day of the east wind. No wrath, God did not have wrath toward man before mankind sinned. I considered studying horticulture for a short while in High School. I was intrigued by landscapes and the money that could be made by working in that field. But that did not work out too well as I found the boring parts to be way too boring. 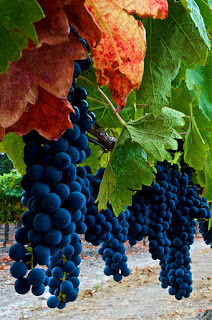 One thing that I know for a fact, however, is that there is no vineyard in the world that grows wine trees. Bottles of wine are not picked off of a vine and served at the table. Wine is the result of a process. God sees man in the same way. When He looks at the vineyard of His people, those branches which are rooted in the True Vine, He sees an amazing bottle of wine. We may not be developed yet. We may not have flowers or fruit yet. But God sees the end product in His Son, and He is excited about it. While this poetic prophecy seems very gloomy with briars, thorns and banishment, we can see some encouraging words as well. Namely, we can see the plan that God has implemented for reversing the curse. This plan is in verse seven. "The striking of Him who has struck them" - we are stricken with the curse, and the only way out was for Christ to take our beating. "The slaughter of His slain" - the moment we ate of the fruit, we surely died. The only reversal is for that mortal punishment to be carried out in the person of Christ. And so, God makes sure that His grapes become good wine.